Free Online Coupons: Personal Creations Memorial Day Gifts: 15% Off! CouponAlbum offers best and awesome deals and coupons.It's a one-stop online discount shopping site. Probably the best way to save a lot of bucks with the least of efforts. Personal Creations Memorial Day Gifts: 15% Off! Last Monday of May is celebrate as Memorial Day, perfect time to remember brave soldiers who laid their lives for nation and all our dear ones who are in heaven. When words just aren’t enough, a memorial gift can show your love and concern. This year fetch personalized sympathy gifts from Personal Creations to express how you feel. Acknowledge a great veteran or anyone else with sweet Memorial Day gifts. Crafted of durable resin, this exclusive stepping stone has a realistic stone texture. 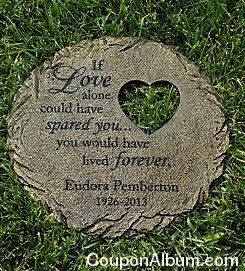 Large 12″ round stone with heart cutout is personalized with any name up to 22 characters, and any two numeric years. It also includes keyhole back for wall mounting as well and weighs 3.20 lbs. This exclusive gift is a beautiful reminder of eternal home and a comforting reminder of your loved one. 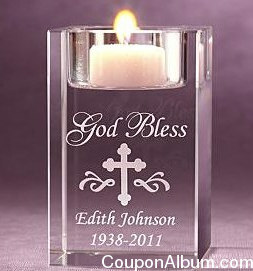 This sparkling glass crystal candle holder bears the sentiment “God Bless” and the image of a cross. You can personalize it with your message on 1 line, up to 18 characters and any 2 memorial years. It holds a standard votive candle.